There are some seals with clear Indus themes among Dept. 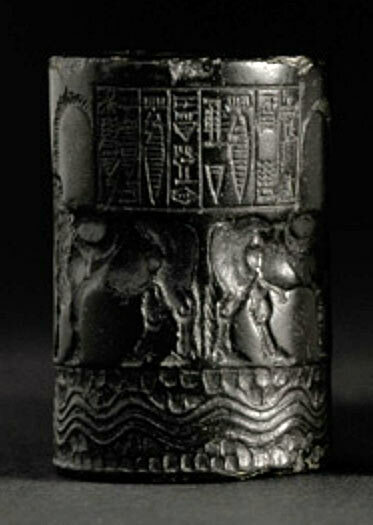 of Near Eastern Antiquities collections at the Louvre in Paris, France, among them the Cylinder Seal of Ibni-Sharrum, described as "one of the most striking examples of the perfection attained by carvers in the Agade period [2350–2170 BCE]. . . . The decoration, which is characteristic of the Agade period, shows two buffaloes that have just slaked their thirst in the stream of water spurting from two vases held by two naked kneeling heroes." It belonged to Ibni-Sharrum, the scribe of King Sharkali-Sharri, who succeeded his father Naram-Sin. The caption cotinues: "The two naked, curly-headed heroes are arranged symmetrically, half-kneeling. They are both holding vases from which water is gushing as a symbol of fertility and abundance; it is also the attribute of the god of the river, Enki-Ea, of whom these spirits of running water are indeed the acolytes. Two arni, or water buffaloes, have just drunk from them. Below the scene, a river winds between the mountains represented conventionally by a pattern of two lines of scales. The central cartouche bearing an inscription is held between the buffaloes' horns." The buffalo was known to have come from ancient Indus lands by the Akkadians. 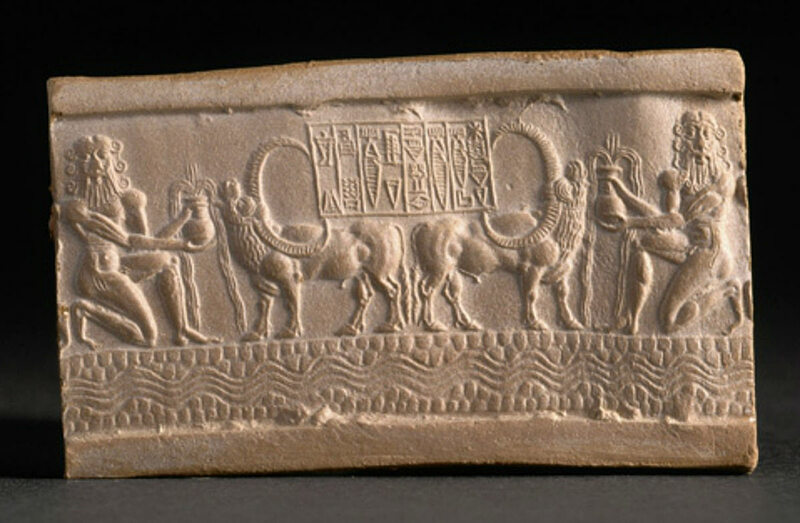 The first image shows the imprint of the cylinder seal, the general Mesopotamian type of seal as opposed to the usually square stamp seals found in Indus cities. The second is the diorite cylinder seal, the negative of the pressed sealing. A second seal at the Louvre is made of steatite, the traditional Indus material, "the animal carving is similar to those found in Harappan works. The animal is a bull with no hump on its shoulders, or possibly a short-horned gaur. Its head is lowered and the body unusually elongated. As was often the case, the animal is depicted eating from a woven wicker manger." Both seals can be found in Room 8 of the Richeliu wing, Iran and Susa during the 3rd millennium BCE.